In this tutorial, we will build on the developer tutorial, extending it to demonstrate queries. The native query language can filter results returned using criteria and can be invoked in transactions to perform operations, such as updating or removing assets on result sets. Queries are defined in a query file (.qry) in the parent directory of the business network definition. Queries contain a WHERE clause, which defines the criteria by which assets or participants are selected. This tutorial uses the tutorial-network business network developed and deployed in the Developer-Tutorial. The business network created in the developer tutorial must be updated. The updated business network contains two events and an additional transactions. The model file must be updated to contain events and a new transaction. Open the model (.cto) file for the tutorial-network. Save the changes to your model. Now that the domain model has been updated, we can write the additional business logic that gets executed when a transaction is submitted for processing. In this tutorial we have added events and queries to the business logic below. Open the transaction processor function file lib/logic.js. 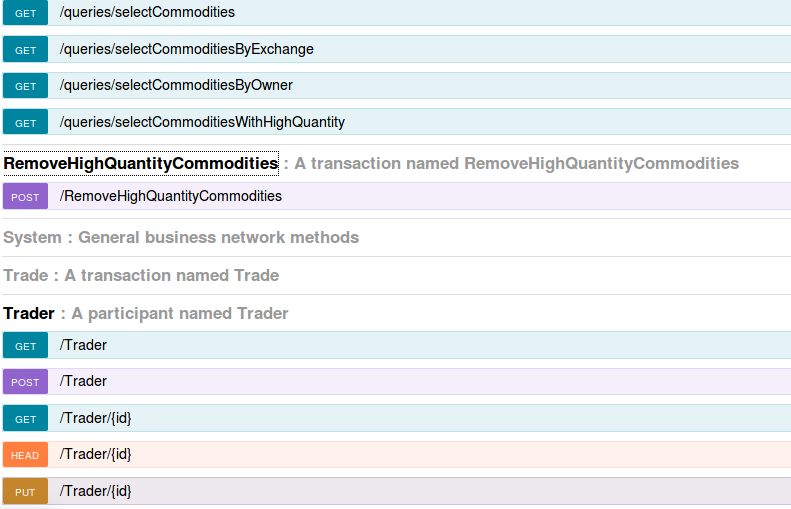 The first function tradeCommodity will change the owner property on a commodity (with a new owner Participant) on an incoming Trade transaction and emit a Notification event to that effect. It then persists the modified Commodity back into the asset registry which is used to store Commodity instances. The second function calls a named query 'selectCommoditiesWithHighQuantity' (defined in queries.qry) which will return all Commodity asset records that have a quantity > 60 ; emit an event ; and remove the Commodity from the AssetRegistry. The queries used by the Transaction Processor logic are defined in a file which must be called queries.qry. Each query entry defines the resources and criteria against which the query is executed. In the tutorial-network directory, create a new file called queries.qry. description: "Select all commodities based on their main exchange"
description: "Select all commodities based on their owner"
description: "Select commodities based on quantity"
Save your changes to queries.qry. After changing the files in a business network, the business network must be repackaged as a business network archive (.bna) and redeployed to the Hyperledger Fabric instance. Upgrading a deployed network requires that the new version being deployed have a new version number. In the tutorial-network directory, open the package.json file. Update the version property from 0.0.1 to 0.0.2. We need to deploy the modified network to become the latest edition on the blockchain! We are using the newly created archive business network archive file to update the existing deployed business network; this is the same business network name, that we used during the Developer Tutorial. Switch to the terminal, change directory to the folder containing the tutorial-network@0.0.2.bna. We will now integrate the newly updated business network with queries added, and expose the REST APIs for this business network. Open a web browser and navigate to http://localhost:3000/explorer . You should see the LoopBack API Explorer, allowing you to inspect and test the generated REST API. Before we proceed, we need to create some data, to demonstrate queries adequately. 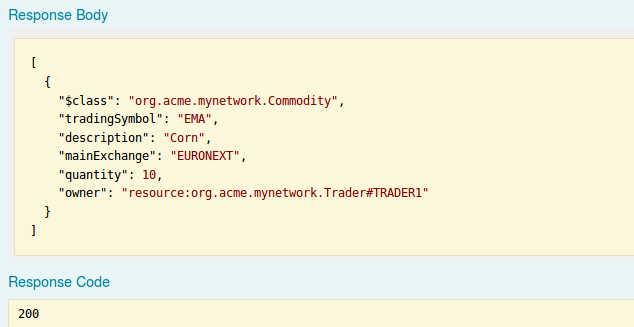 Using the sample JSON data provided, create 3 Traders (Participants)and some more Commodities (Assets) using the REST APIs. Now scroll up to the top and click on 'Commodity' object in the REST Explorer. Now that we have some Assets and Participants, we can test out some queries using the generated Query REST operations. Now that we have assets and participants, we can try out some queries. The simplest REST query we can try out first is our named query selectCommodities. Expand the 'Query' REST Endpoint and you will see the named queries we defined in our model. These queries are now exposed as REST queries and for which a /GET operation is generated, Note that the description of the query (that we defined in our model definition) is shown on the right hand side. Click the 'Try it Out' button. It will return all existing Commodities - there should be 2 assets returned. 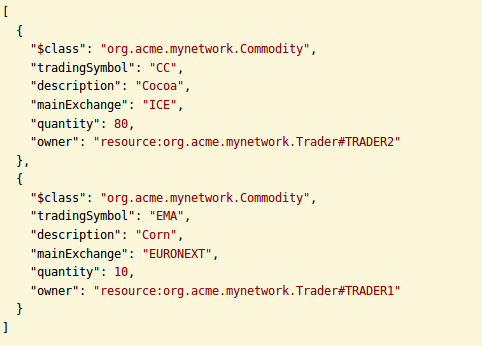 Let's select all Commodities by their Exchange - for example 'EURONEXT' main exchange. 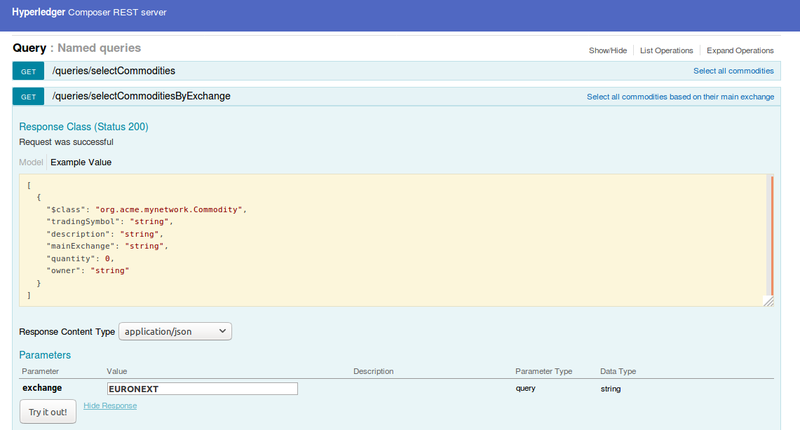 Expand query Endpoint 'selectCommoditiesByExchange' and scroll to the 'Parameters' section. Enter 'EURONEXT' in the 'Exchange' parameter. Finally, you will recall we had defined a simple query that filters Commodities with a Quantity greater than 60 in our query file. Queries are very powerful, when used in transaction functions, as using queries allows transaction logic to set up the set of assets or participants to perform updates on, or for creating remove actions for example. We use the selectCommoditiesWithHighQuantity query in the removeHighQuantityCommodities transaction. If you execute this /GET operation in the REST Explorer, you'll see it selects only those assets greater than 60 in quantity. 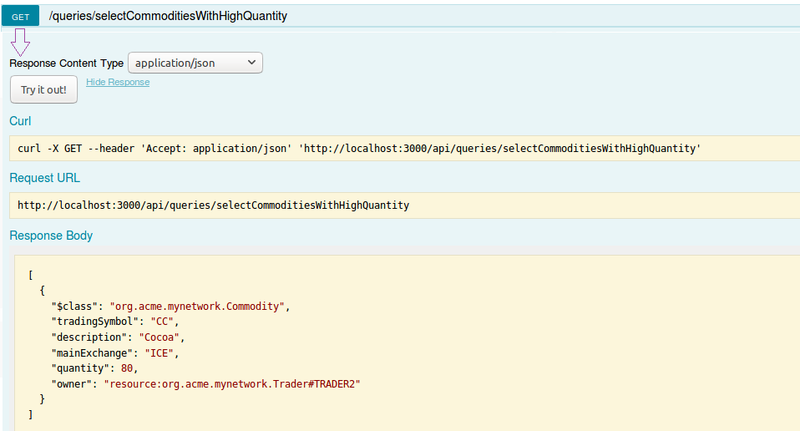 Now let's use the query to perform a removal of high quantity Commodities. First check for yourself how many Commodities are present (use the 'Commodity' /GET operation) and you should see at least two Commodities, one of which (Cocoa) has a quantity > 60. Let's check out the actual query, by clicking on the REST Endpoint /selectCommoditiesWithHighQuantity and click /GET then scroll down to 'Try it Out' - there should be one Commodity that meets the criteria. OK. Now let's execute a REST transaction, that uses our 'High Quantity' query definition to decide which Commodities to remove. 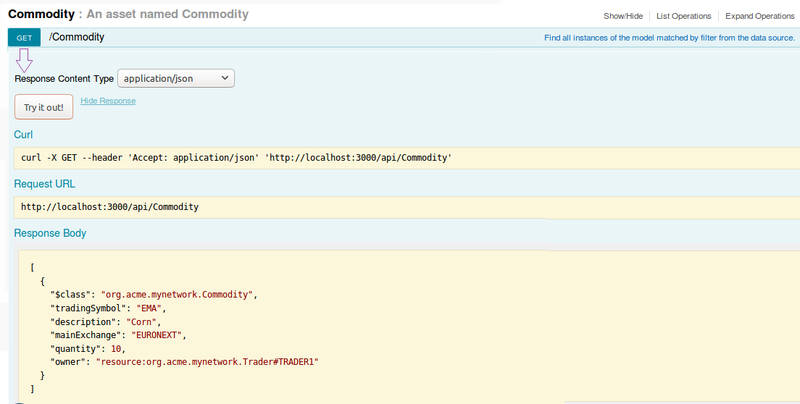 Click on the RemoveHighQuantityCommodities REST Endpoint to reveal the /POST operation for same. Click on POST, scroll down to the Parameter section and click 'Try it Out' - note: you do not have to enter any data in the 'data' section. Finally, let's verify our Commodities status. Return to the 'Commodity' REST Operations and once again perform a /GET operation....'Try it Out'. The results should show that the Commodity asset 'Cocoa' has now gone, ie only those Commodity assets with a quantity <= 60 still remain, ie asset 'Corn' in our example. The named query fed the transaction update (to remove high quantity Commodities) and which was executed in business logic. Well done, you've now completed this tutorial and we hope you now have a much better idea of the power of queries in Composer. You can start creating/building your own queries (or modifying the existing queries and adding associated data to this business network - note: you would need to re-deploy any query changes) to try out!